Neal Pionk: What Do We Have Here? On the surface, one of the few bright spots of this forgettable Rangers season was Neal Pionk. Pionk, who will be 23 at the start of next season, was an undrafted NCAA prospect out of UMD. After starting the season with the Wolf Pack, Pionk was called up to the Rangers on February 8th, and almost immediately became one of AV's go to guys. Over his 28 games, Pionk would average 22:23 of ice time a night, highest on the team, and would play in all situations. The games on MSG and NBC Sports were often filled with Pionk praise. And maybe he deserved it, but also, maybe he kind of didn't. A major part of the "eye-test" is always going to be: "who is on the ice a lot?" And that makes sense. If you're watching the game, you're going to remember the players who play a lot, good or bad. Let's look past the eye-test for a minute, and see how Pionk matched up against the rest of the league's d-men in some key metrics, 5v5, with a minimum of 300 minutes time on ice (n=238). Using team relative metrics allows us to ignore the noise of playing AV hockey that Pionk had to deal with, since the relative metrics allow us context in to how he performed relative to his team. What we see is that Pionk had some really, really bad on-ice performance where he was bailed out by timely goaltending and shooting. We see this because his on-ice shot attempt xG numbers rank very poorly. Interestingly enough, it's the offensive side of the game where Pionk really struggled. With Pionk on the ice, the Rangers generated 11.93 less shot attempts and 0.81 less expected goals per 60 minutes. His shot attempt suppression numbers (relCA60) left something to be desired, but were not totally terrible. We need to take into account however that Pionk was essentially thrust directly into a top-pairing role halfway through his first professional season. Context is important, but it can't be used as a crutch for poor performance. We can't say things like: "Pionk isn't bad, look at the situations he had to deal with?" Instead, we should view this as: Perhaps Pionk was not suited for the role that he was put into at this point. The difference here being that usage isn't an excuse, it is context. If Pionk wasn't performing well in his usage, his usage should be changed. The Rangers, however, need to figure out how much of Pionk's poor on-ice performance was usage based, and how much Pionk's poor on-ice performance was, well, poor play. I'm uncertain if there is an effective way to do that, but it won't stop me from trying. We could utilize a tool like Steve Burtch's dCorsi to understand a baseline impact of usage and other factors on a players shot attempt numbers. I'm going to go in a slightly different direction, and use the similarity scores from the old MILLER model to see if we can find similar players to Neal Pionk, and evaluate how their careers progressed. Note: I don't have a good write-up on MILLER, surpirsingly, but it operates similar to 538s CARMELO model for basketball. Similar being a very, very generous word for MILLER. I'm working towards touching this up. Very long-term project for me, though. It should also be pointed out that this is strictly for fun. I'm putting no real-world weight onto this. Just running the 'model' and having some fun with the outcomes. Admittedly, there is no statistical significance to any of these weights. It is totally subjective, totally malleable. And really, I'm posting them in the hopes that someone tells me I'm an idiot, and the weights are applied wrong, so we can get a stronger sense of similarity. Running the 'model' for Neal Pionk, we get only 16 d-men seasons for ages 21-23 with a positive similarity score. Cody Ceci being the #1 similarity comparison here really does not paint a great picture for Pionk. It should be noted that a 29 really isn't that strong, so the model had a tough time coming away with a strong-similarity for any player for Pionk, which I think makes some sense given the sample size of Pionk information that we have. I should also again caution that this is straight up Gorilla Math, Grama ROUNDERS style, and everything about it is up for debate. That's the only way this will get better. The following plots don't weight the players with higher similarity scores to Pionk more than the guys with lower ones. It's all even when it should not be. In the iterations of MILLER where I had been projecting forward goals and point totals, weights were applied for strength of similarity. Future iterations should have this weighting processed into the results, but for now, these do not. Thus, the following visulizations assume that everyone with a positive similarity score to Pionk had the same weight. That's wrong. But, here we go. It should be noted again that in this particular metric, a negative number is good. We can see that the few players that Pionk was similar to had a it of trouble getting into those negative numbers throughout their careers, as Pionk's trendline, by using these players, eeks positive on the relTxGA60 side and can't seem to get negative on the relTCA60 side. 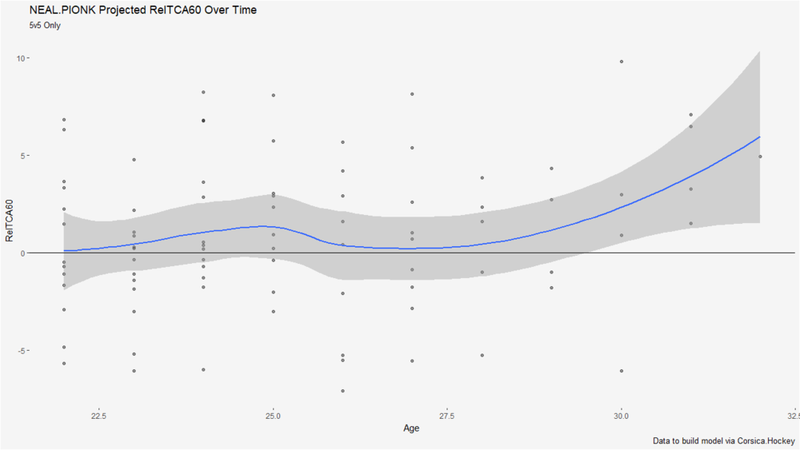 Further noted that the players we do have here, for data into their 30s, really struggled. But that's a long way away, and things do change. I'd be remiss if I didn't once again call out that none of this is gospel. That we only have 28 games of data on Neal Pionk. That in these 28 games, he was playing Alain Vigneault hockey. That in these 28 games, he was mostly seeing #1 pairing matchups. I don't think I can stress this enough. The hope is that next season, with a new coach, that they come in and recognize that maybe Pionk isn't suited to being a first-pairing D in the NHL just yet. And hopefully, the ease of his usage provides an uptick in his on-ice impacts. The strongest bet in the world is that when we run this model again for Pionk next off-season, we see a much larger and more generous sampling of similar players.